Many translation and marketing agencies alike claim that they offer a full range of translators, offering the best possible quality and a voice for every message, and sometimes translators are likely to follow that line. They claim that they are able to translate texts for every audience, no matter the underlying product or service. That sounds great, but mostly it is something other than the whole truth. In reality they are able to translate many texts and documents easily, making sure they offer quality translations that do not hurt anyone. At the same time, most of their translations do not distinguish themselves from other translators in tone or style. So whether they are working for Shell or for Apple (just to mention two entirely different companies), they still use the same vocabulary, constructions, syntax and expressions. Although that goes unnoticed in many cases, it can ultimately make companies’ marketing and product texts too much alike. In the worst case, the end clients will no longer distinguish companies from each other, except by their products and services. That is why a unique tone of voice is important. Only by having their own tone of voice can translators distinguish themselves from other translators and help companies differ from each other. In other words: a unique voice is so powerful that it can help companies build their own identity and stand out in a market that is overly crowded. It can be possible to have a tone that is a combination of both or to practice different tones for different audiences. Our voice, however, reflects our personality, which make it difficult to separate the two. It is part of who we are. While I am quite verbose in my daily life, I can write inspirationally and commercially as well. On the other hand, I will never be like my English to Russian translating colleague Dmitry Kornhukov, who boasts a vocabulary of powerful and sparkling words, using terms like ‘awesome’ in almost every sentence. If I were to try this, family and clients would shake their heads, claiming that it is a tone of voice that does not suit me. And because it does not fit naturally, it will be difficult to master as well. Mastering a second voice is as important and difficult as mastering a second language. At the same time it is very easy to use your natural tone of voice in translations. Using a voice that is close to you enables you to speed up your work and leads to a natural flow. However, translating for a client who demands a tone of voice that is not part of your ‘voice toolkit’, will leave you with a job that seems endless, requiring you to rethink every sentence and leading to lots of uncertainty because it is difficult to crawl into a skin that doesn’t fit well. So it can be difficult to work for clients whose style guides and brand books dictate a certain tone of voice to be used. I remember about five years ago when I was pitching to write for a magazine. They sent me a small job to give it a try, but it took me two hours to think about the tone of voice: it was different from my natural writing habits and led me to think about every single word. In the end it turned out that I was not the right person for the job. The same happened recently when I wrote some text for clients of a local marketing agency. While the agency was used to make cosy and inspirational websites I was unable to find a tone of voice that fit the designs. After three successful jobs we mutually agreed to end the relationship because it was too difficult to fulfil the assignments easily. While stumbling upon your own limitations is not necessarily a failure, it can have disastrous results for companies that are trying to distinguish themselves in how they sell their products and services. However, using your personal tone of voice can work the other way around as well. Because it is so unique, it can be one of the most powerful tools in your whole marketing toolkit. Your tone of voice can be an important part of your personal branding and make companies look specifically for you. In the past, marketing departments of three of the five biggest smartphone brands chose me as their preferred supplier for Dutch translations (I failed for the fourth because our tones of voice were too different to be successful). In such a position you can put your stamp on marketing campaigns and at the same time improve a company’s branding for even further success. If a company is only starting with translations in your language pair you can establish mutual success by building the tone of voice from the ground up. Being the first translator to translate apps, documents and websites for a certain brand enables you to define the tone and style that is to be used for years. If companies grow, they will attract a user base that do not know their brands other than in your tone of voice. If that is a successful combination, you will not only help the company to reap the fruits, but you will as well by having an return client that trusts you as their primary source of truth in your language pair. So, using your personal tone of voice can lead to business success. Awareness of your own voice and how you are using it is the first step in ensuring a great relationship with your client. Here are a few tips to help you further. This is not the most difficult part of the story. However, you need to reflect on your personality. Are you using a vocabulary and style that shows who you are and what you do? Or do you use a language that is only slightly related to your deepest personality? If so, you might find yourself struggling with translation jobs for certain clients because you cannot seem to find the right tone of voice. Apart from a unique, personal tone of voice you might consider some other styles. For some people this is easier than for others. For instance introverted characters cannot easily get used to the style of extroverted personalities. However, it can still be worth a try to master some other styles because that opens new perspectives. Nevertheless, stay away from voices that you cannot master easily. Business goals help steer you in the right direction. However, your goals should align with your possibilities. Reflect on goals you have, like working for a certain company or audience, and realize whether they do (or do not) fit your style. Then change your goals or set out to master the right tone of voice. If you choose the latter, be patient. As a baby you did not learn to speak within a few weeks, and you will not master a tone or voice within a month. Every company and brand has its own audience. Be aware of it, as well as of local languages and expressions. Within each tone of voice there are slight variations. 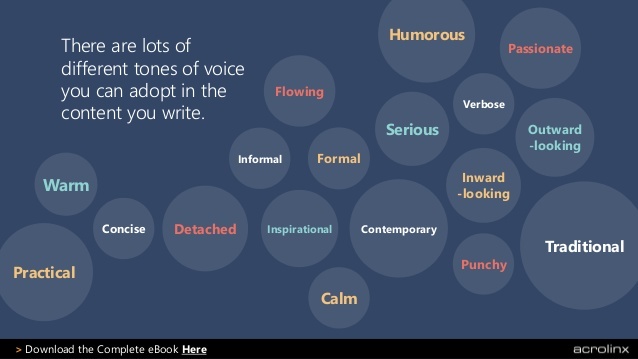 You might, for instance, switch between a formal and informal tone of voice or between a calm and humorous style as they do not necessarily exclude each other. However, make sure that you address each audience the right way, so they identify with a brand. In the end you are serving a company as a translator, not as yourself. At first hearing, many people tend to express themselves in the same way. There are, however, nuances that can make a difference. You therefore have a genuinely unique tone of voice that can make the difference for your business and that of your client. It can help you to adopt the right jargon or even slang, so that you can make your client successful. In the end, companies looking for success have their own thoughts on what they need to reach that goal. Being yourself is the key to that, and using your voice the way you are used to is the best way to exploit your personality in translations.